For Throwback Thursday, here's a little story that began way back in December of 2002, just about a week after getting home from my very first "In the Mood" tour. I was driving to a gig in DC when my car suddenly became Car#3 in a four-car accident. My car was demolished and my bass came pretty close to being destroyed as well. It was all in pieces inside the bag when I took it out of the car. The neck had come off, and a shoulder was smashed, among numerous other injuries that I don't want to think about anymore. It was definitely the worst day of my life up until that point. I took it to David Gage in NYC and he said he could fix it, but it would be months and months before I'd see my bass again. He did an absolutely spectacular job restoring it, but while I was waiting for this miracle to occur, I had no idea what to expect and the whole thing was extremely depressing. For me winter is depressing enough without having something like that happen. In an effort to make myself feel better, I decided to go to Florida for a few days, and just chill out on the beach, soak up the warm sunshine, take long walks while pondering life without my bass, eat fresh seafood, drink beer, etc. Doug wasn't available so I went by myself and had as delightful a time as I possibly could, under the circumstances. On a last-minute whim, I bought one of those miniature "orange trees" that they used to sell in little cardboard boxes at airports in Florida, as a souvenir for Doug, since he hadn't been able to come along. I figured it would probably last about six months and that would be that. He took it over to his studio, and now it's back in our house, completely loaded with fruit - exactly 41 of these weird little one inch oranges. For the past couple of days, Doug has been making tea with these things, along with some cinnamon bark, a couple of cloves, and a crushed cardamom pod. Now that I'm ingesting these mystery oranges I have suddenly become more curious about them. Like, are they poisonous? Since they are no longer serving a strictly ornamental purpose in our household, I needed answers. 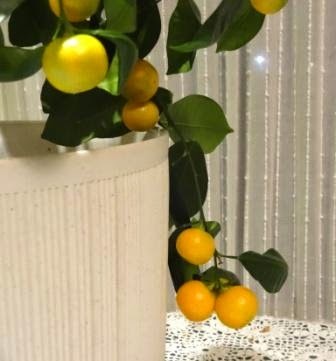 When I googled "miniature orange trees sold in airports" I discovered that our plant is actually something known as a calamondin and the fruit is quite edible in certain applications. The tea Doug has been making tastes sort of lemony and is delicious with those various spices added. So out of this miserable situation, not only did my bass come back from the dead in better shape than ever, but now, twelve years later, I'm drinking the best tea I ever had, and loving it. And I’m not even really a tea drinker!